We will be starting the week with Collective Worship which is designed to encourage the children to think of the unique attributes that make them an individual, who is special in their own way. It then moves on to identify that our school is a better place when those around us feel valued, supported and able to be ourselves. We are all looking forward to seeing Leeds class leading Family Collective Worship on this theme on Tuesday 14th and Thursday 16th. Within our classes children will learn about this important issue through their PSHE lessons which will emphasise the importance of our school community. 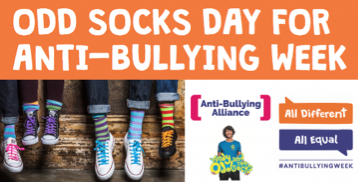 Friday 17th November we will take part in Odd Socks day in which all we have to do to take part is wear odd socks to school, it couldn’t be simpler! We will include this as part of Non Uniform Day in support of Children in Need. Odd Socks Day is designed to be fun! It is also an opportunity for children to express themselves and appreciate individuality as well as supporting other children with their voluntary donation of £1. The children will learn the unique song during Friday's collective worship and some teacher's will share what makes them unique!